The acoustics in public bathrooms stinks! One of the problems with bathrooms is they're loaded with hard surfaces that have a tendency to echo and amplify the kinds of sounds that nobody wants to hear in the first place. Let's face it, none of us likes public restrooms, and I've already posted more than a few rants about how they can be improved. Today I'm going to tackle another 800 pound gorilla... the SOUNDs you hear in public restrooms, and what I think should be done about it. Admit it. You pick your nose. Everybody picks their nose. Do you remember the Seinfeld episode where Jerry's girlfriend left him because she saw him scratching his in his car, but she thought he was picking his nose? What's the big deal? Doesn't EVERYONE pick their nose from time to time? We all have noses, and from time to time we get things stuck in our nose that simply won't come out when we blow our noses. When that happens, what are we supposed to do? It's not like we have a thousand ways to get rid of snot. When boogers won't come out when we blow our nose, there's only one strategy that's proven to work... picking your nose. About a year ago I did a video about how useless Stormtrooper Armour is. After seeing Rogue One, it's even worse. When I posted my previous video Stormtroopers armour, I got a lot of comments from people who actually defended the armour as being something that was actually pretty useful. Naturally, I disagreed. My argument was that the armour clearly is no defense against blasters and other weapons in the Star Wars Universe. Most of the comments centered on the fact that nothing can defend a person from a blaster shot, but the armour was a good overall protection from all sorts of physical contact. While that seems like a bit of a stretch, I can understand it, even though you never see any scenes where a Stormtrooper avoided injury because of their armour. Did Noah build the FIRST BOAT EVER? First of all, let me say that I'm not an atheist. I have a very strong Christian faith, but there's a few things in The Bible that can really make you go Hmmm, such as the story of Noah's Ark, as it's written in the Book of Genesis. Once you get beyond the debate of whether Noah actually built an Ark large enough for at least two of every single animal on the plant, there's an even bigger issue that comes to mind, that you never hear anyone talk about, until now... Did Noah INVENT boating? Why do so many people leave the stickers on their hats? This has boggled my mind for years. Why the heck would anyone want to walk around with stickers on their hats? As far as I'm concerned, when I buy something, the first thing I do when I take it home is take off all the tags and stickers, but for some reason I see people everywhere with the stickers still on their hats. What's up with that? It makes no sense at all. They pay for the hat. Take it home, and keep the stickers on it. To me, they look like Minnie Pearl. Ever Heard of Open Back Shoes? Why do some people ruin their shoes by crushing the back? This one boggles my mind. For some reason I see a lot of people who completely destroy their shoes by wearing them like a sandal. Why would they do that? Haven't they ever heard of open backed shoes or sandals? I can't imagine why this is such a widespread thing. It's pretty easy to buy open backed shoes and slippers in any store that sells shoes, so why buy a pair of regular shoes, then stomp all over the back heal? It can't be as comfortable as something designed specifically with an open back. According to a team of scientists, THIS is the world's FUNNIEST JOKE! Science has been a lifelong passion of mine, so I read a lot of scientific books and magazines. What fascinates me most is the diversity of subjects that scientists choose to study, including of all things, comedy. Apparently, a bunch of scientists not only studied the possible biological origins of comedy and laughter, including why some animals share the ability to laugh, some of them even decided to look for the "World's Funniest Joke". Gary Larson was a comic genius. Like a lot of people, my favorite part of the newspaper is the comics. 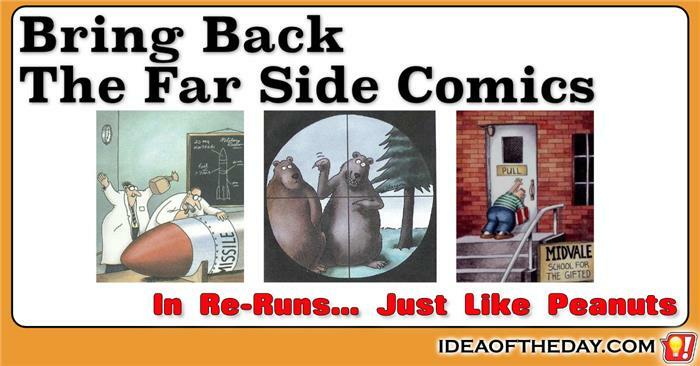 Among my all-time favorites is The Far Side, by Gary Larson, which ran for 15 years until he retired in 1995. His famous one panel cartoons were unlike most comic strips in that there was no central characters. Each cartoon was a unique creation featuring both human and non-human characters, including snakes, cows, chickens, aliens and even one celled animals. Larson retired The Far Side at it's peak in popularity and unlike Charle's Shultz's Peanuts, newspapers don't carry re-runs, which is a shame, because just like Peanuts, his cartoons were timeless. 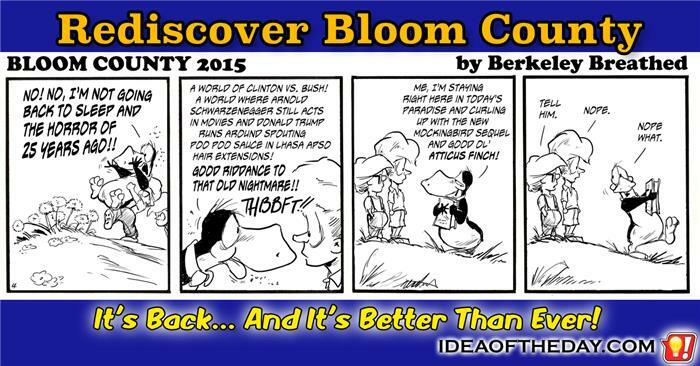 Rediscover Bloom County. 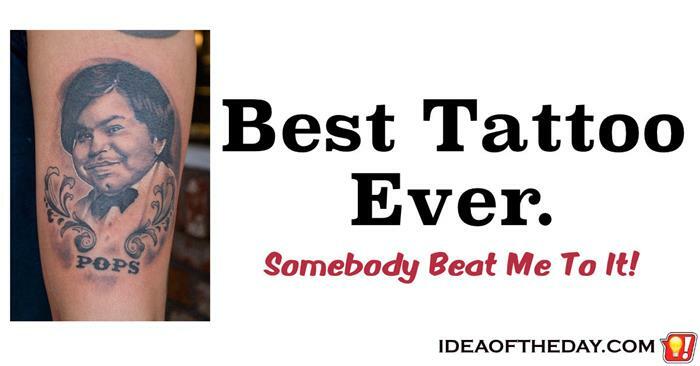 It's Back, and It's Better Than Ever! In 1987, Berkeley Breathed won the Pulitzer Prize for Editorial Cartooning. Two years later, he retired. I have to admit it. For years the only thing I read in the newspaper were the comic strips. Other than a quick glance at the headlines, I barely even flipped the pages. I always went directly to the comics. I'm a positive guy by nature, so I avoid reading the news because it's almost impossible to find anything positive there... other than the comics. We can learn a lot from Jerry Seinfeld from this classic New York Times Interview. In this interview, we see how he developed a Pop-Tart joke over a two year period, from it's inception to completion. While most comedians, including Seinfeld don't spend two years writing a joke, we can clearly see the reason he has become one of the greatest stand up comics of all time. He describes how an idea for a joke triggers a series of funny associations that are systematically blended and re-worked time and time again until the he gets the best combination of funny words, rhythm and pacing and the all important punchline. While this may seem excessive, it's one of the reasons for his prolonged success, and it also gives us a great insight into how all great art is created. 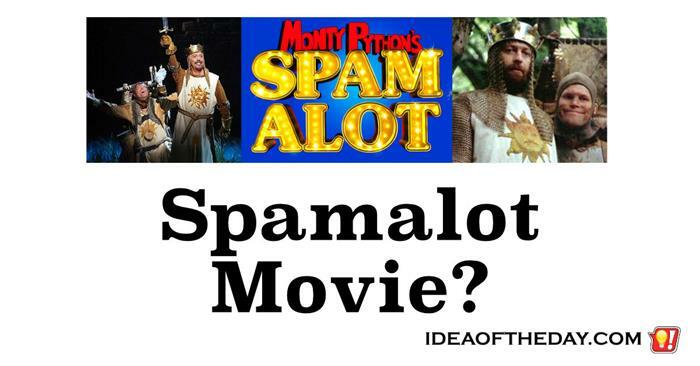 Monty Python's Spamalot should be made into a movie. When Monty Python and the Holy Grail came out in 1975, it became a one of the biggest cult classics of all time. Forty years later, millions of people still talk it and it spawned a hugely successful Broadway musical, winning the 2005 Tony award for Best Musical. Although Spamalot is based on Monty Python's and the Holy Grail, I think that a film version of the musical is way past due. It's been over 10 years now, and there still isn't any talk of a movie. Remembering Rodney Dangerfield - He taught us how to laugh at ourselves. Rodney Dangerfield died 10 years ago today. 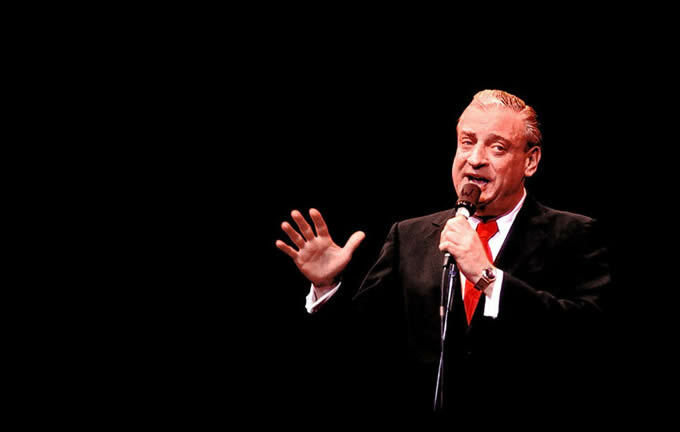 It seems like only yesterday, but on October 5th, 2004, Rodney Dangerfield passed away. It's hard to believe it's been that long ago, but I couldn't resist reflecting on his legacy in my thoughts for today. What stands out most about Rodney Dangerfield was that he was different. Before Rodney came along, most comedians told jokes about other people, whether real or imaginary. Rodney's jokes were about himself. Because of Rodney, we learned three life lessons. 1. Joking about other people can hurt their feelings... so DON'T Do it. Poke fun of yourself instead. 2. When you laugh at yourself, people laugh with you... not at you.